How much does a social impact report cost? 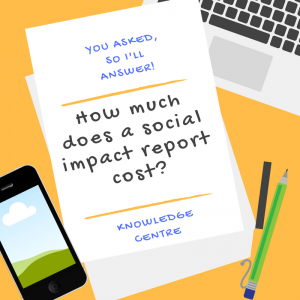 You asked, so I’ll answer – How much does a social impact report cost? The cost of a social impact report varies and depends on what you actually want in terms of content in the report. The key element would be determining the scope of what you actually want to look at; so if you were only looking at one project, activity or service, then the scope and cost of the report is likely to be smaller than if you’re looking at the entire organisation. Also, if you’re not just looking at your social impact but also your economic and environment impact then you will potentially have more elements and aspects to the report. The other thing that affects the social impact report is whether you are looking at doing a case study based impact report; so very much looking at the qualitative information you have and perhaps doing some surveys and data collection with your client group based on the qualitative information that you want to collect. Or, whether you are going to also be doing a social return on investment (SROI) calculation because this will increase the amount of work involved in producing the report. Alternatively, you may decide that you just want to do social return on investment, and not have any of the qualitative or case study based information in there. That would potentially reduce the price slightly. The amount of data you’ve already collected also impacts on the cost of a social impact report. In many organisations, there may be some data that’s already been collected that’s useful in terms of looking at outcomes. What tends to happen is that most organisations are collecting data that is about customer service or the quality of the service; so asking people whether they enjoyed the sessions, whether they liked the person that helped them, what did they think to the room or the venue etc. These kinds of questions are not anything to do with outcome-based information. These are very much about the quality and customer service, which is still important and relevant to collect information on, but they’re not going to really help you in terms of producing a social impact report. This means one of the first steps, that can take quite a long time, is to actually look at the types of data that you’re already collecting and to see how useful that data is in terms of measuring the outcomes that you achieve. If you’ve not got very useful information in terms of outcomes, you’ll need to think about redesigning the forms, surveys or questionnaires you use to collect information from your clients so you can then start to collect information on your outcomes. This can mean the process from starting and completing a social impact report can take several months, because you need to go out and collect data from your stakeholders on outcomes if you haven’t already got it. It will also mean you’ll need to spend time creating the new questions (or pay for this) and have a system for collation and collecting that information. Again, another thing that can increase the cost is if you keep all of this data manually, and then just send that information in paper format to the person that’s writing your social impact report; because they’ll then have to collate and analyse the data for you. Whereas if you do some collation, perhaps on a spreadsheet, of the different types of outcomes from the information you’ve received, this will reduce the cost because they’ll have to spend less time analysing your data. In terms of the types of questions that you ask on your surveys, if you can create questions that give them options to select from that makes the analysis much easier and quicker (so it would cost less). Whereas if they’re given questions where they can input text or write in a response because those responses will need to be manually grouped and categorised before the analysis can be carried out it will take longer and be more costly. A way to save money is to do this analysis yourself if possible. The next item that can increase the cost for a social impact report is if you don’t want to do the data collection yourself. If you’re asking the consultant to do that for you, then obviously there’s an additional cost for that. Generally, I tend to encourage organisations to do the data collection themselves because they have access to their clients/beneficiaries and stakeholders much more easily than the consultant would. It makes it a much quicker process. Alternatively, if you wanted the consultant to do it, then you’d be looking at being charged for their time for doing the data collection for you. This might include sending questionnaires/surveys out, telephone surveys etc. with your different stakeholder groups. The other thing that you may want to include is some focus groups in order to get some additional in-depth information from your client group, or perhaps some partner organisations that you’re working with. If you want the consultant to run them, obviously then there’s a cost associated with them. If you’re looking to consult several different stakeholder groups, again, it would mean that there would be additional costs because there’ll be much more data from a variety of stakeholder groups. If you wanted to collect information from your clients, your volunteers, staff, board members, partner organisations, funders, and potentially suppliers; then there’s a lot of different questionnaires that would need to be designed to capture the right information from each of those stakeholders. Then, there will be a lot of data to analyse and sort; and obviously then more information to incorporate into the report. I would encourage people to try and think about who are the key stakeholders that need to be consulted so that you’re reducing the costs around data collection and analysis. Ideally, you would want to consider your three key stakeholder groups, possibly four. Usually this is your clients/beneficiaries, staff or volunteers, key partners or funders and your Board. If you do decide to do a social return and investment (SROI) calculation within your social import report, then one of the key areas that will either reduce or increase the costs of the report will be the types of outcomes that you’re achieving; because if they’re very common outcomes, such as employment/training outcomes, improving well being, mental health, reducing offending, reducing drug or alcohol misuse. It could also be things around young people not being engaged in drugs, gangs etc. These kinds of outcomes are typically quite common and there’s several different readily available financial proxies and values that can be used for those. Whereas if you’ve got a very unusual outcomes for your project, then it will be much more difficult to find the financial values and proxies for those. This will take the consultant longer to do than if they can just pick off the financial values quite quickly from the databases and spreadsheets that are available online. The other area that can be included in a social impact report is looking at internally within the organisation the social impact that is created. Up until now, what we’ve talked about is really looking at the social impact or social value that’s generated from the projects, activities or services that the organisation delivers; but the organisation will also internally have a social impact. If you’ve got volunteering opportunities within your organisation, you’re training people, you’re employing people, you’ll also have an environmental impact in terms of whether you recycle and reuse things, your CO2 emissions from your electricity and gas usage, how much travel your staff or volunteers do to deliver their work, and how much waste you send to landfill. These are some of the things that you can also look at as part of your social impact report. Again, if you wanted to look at these things, that will require additional calculations and work to be done in order to look at either the social impact of them or to do the social return and investment calculations for these; which would increase the cost. In terms of when I’ve worked with organisations, from my experience, a very, very simple and basic social impact report can be done for around £1,500 to £3,000. Whereas as it gets more complex and you’ve got more elements in there, and need more help with data collection and stakeholder consultation, then you’re looking around £4,000 to £7,500. If you want to look at lots of areas and you have got a lot of different aspects to your social impact, as well as also wanting social return on investment done in quite a lot of detail, then you’re probably looking around £5,000 to £15,000, depending on how big the report is. Really simple, quite quick pieces of work where you’re only looking at a very small project can be done relatively cheaply. Whereas as you scale up and want to look at more of your services or activities, then you’re obviously going to have much more increased costs for doing that work. Be clear why you’re doing the impact reporting – is it for marketing, communicating with stakeholders, sharing with the local community, funders, partners?